The citizens of Myanmar annually celebrate Union Day on February 12. This holiday commemorates the Panglong Agreement signed in 1947. The Panglong Agreement was signed by the Burmese government under Aung San and the Chin, Shan and Kachin peoples in Panglong, Southern Shan State. According to the agreement, Chin, Kachin and Shan peoples achieved full autonomy in internal administration. Anyway, Myanmar didn't achieve its independence in 1947. Aung San and six cabinet members were assassinated by political rivals in July 1947. The nation became an independent republic only on January 7, 1948 and adopted a new name – the Union of Burma. Unlike most former British colonies and overseas territories, Burma didn't become the member of the Commonwealth. Numerous civil wars outbroke in 1948. Some ethnic groups didn't recognize central government, because the British promised them independence as to separate states. 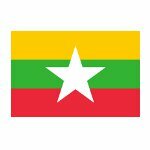 Conditional ceasefire is achieved by the agreement with all the states, and February 12 is observed as Union Day in Myanmar.